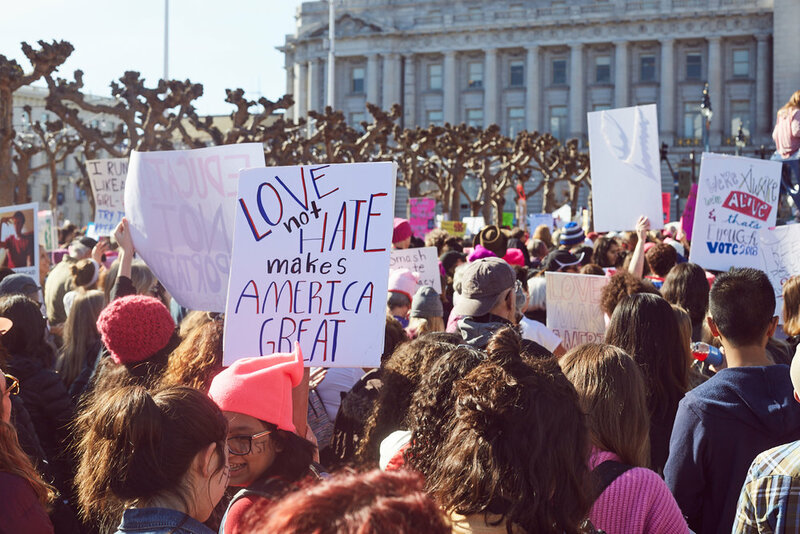 On a beautiful sunny Saturday afternoon, the streets of downtown San Francisco filled with pink beanies, homemade signs, brave women, and even braver men who went out of their way to fight for women. Seeing so many activists gathered in the community touched my heart, especially the senior citizens who stood out in the sun fighting for the same rights they fought for in the 60s. And it wasn't just about women's rights; it was about democracy, our (the people's) government, immigration rights, voting, global warming, intersectionality, and most importantly, standing together strong and united. I could help but wonder what red states think of the demonstrations in the progressive states. This liberal mindset and political stance may be normal for me in the environment I grew up in, but what other perspectives and views are there? I'm curious to listen. After spending a year ignoring the existence of our government (wait, does it exist? ), it was great to hear from the people about the issues they're fighting for. Seeing all these Americans peacefully protesting and practicing our first amendment gives me hope — that we're still a democracy of the people by the people and for the people.